I just wanted to mention that your RNG for your Random Comic (at the time of this post) always leads to this comic when you are at this comic. Not that I don’t enjoy the sentiment of this comic, this is something I’d like to hang somewhere. Thanks for the feedback That Guy. I just wanted to point out that there’s currently a 1 in 19 chance of loading the same page when you click the random comic link so you may just be getting incredibly lucky (or, more likely, I screwed up the code somewhere). Glad you like the comic and hope to have the website running in a more professional manner soon. Problem Fixed! The random button is now 88% more random. 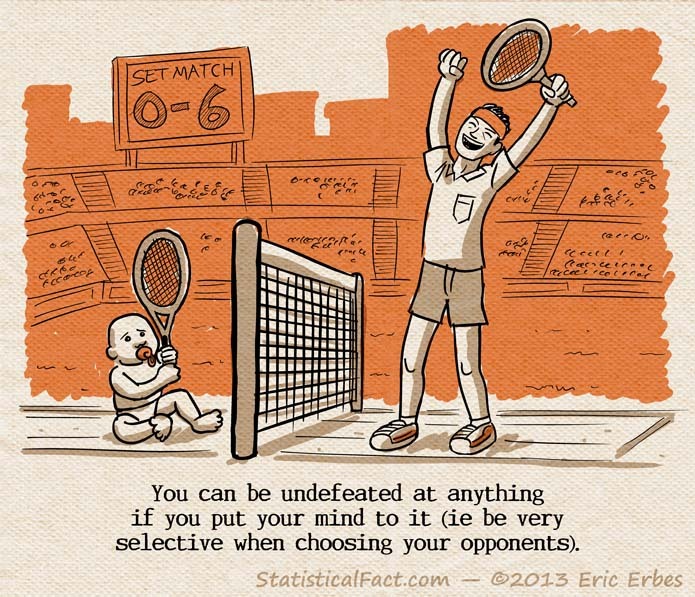 You can be undefeated at anything if you put your mind to it (ie be very selective when choosing your opponents).